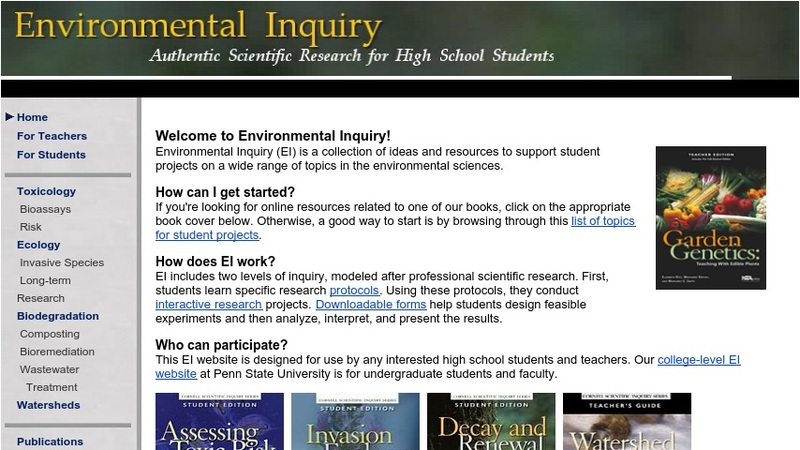 Environmental Inquiry (EI) features curriculum materials and online resources developed to help students conduct environmental science research and participate in communities of fellow student scientists. EI includes two levels of inquiry, modeled after professional scientific research. First, students learn specific research protocols, then conduct interactive research projects based on the protocols. Downloadable forms help them design experiments and then analyze, interpret, and present the results. Discussion boards and an online peer-review forum provide opportunities for interaction with fellow students. Topics include toxicology, invasive species, biodegradation, and watershed dynamics. Each of these topic areas is supported by a textbook and web-based resources.